"Our firm, Kiriu Kosho Kuwaisha, (The First Japanese Manufacturing and Trading Company,) is established for the purpose of encouraging the Japanese industries, and of promoting the greatest possible perfection therein. 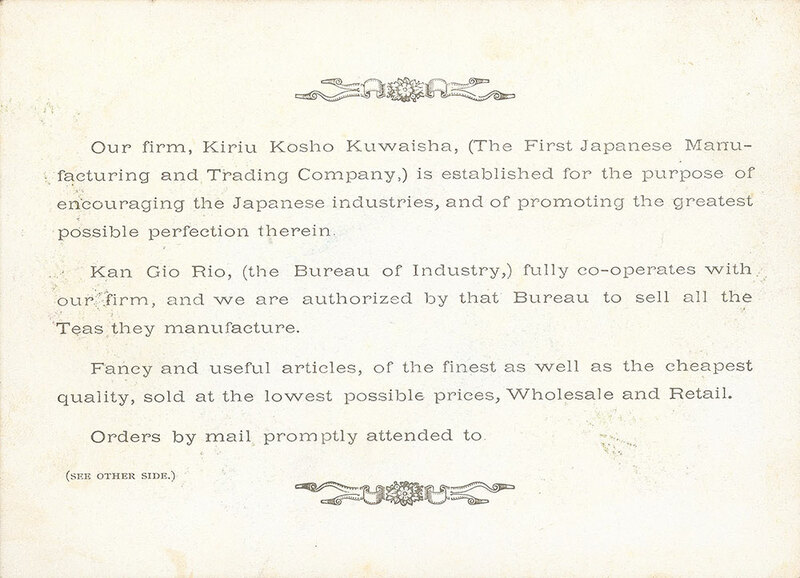 Kan Gio Rio, (the Bureau of Industry,) fully co-operates with our firm, and we are authorized by that bureau to sell all the teas they manufacture. Fancy anduseful articles, of the finest as well as the cheapest quality, sold at the lowest possible prices, wholesale and retail. Orders by mail, promptly attended to." -- Verso card. "Tea, silk, curiosities and other Japanese manufactures. No. 16 Takekawacho, Tokio, Japan. English correspondents Alexandria Palace Park Co., Muswell Hill, London. Branch House Sumpya Hong Kong. Austrian agent, C. Torou, Wallzeille no. 1, Vienna." 1 trade card : 11 x 14 cm. Exhibit title: Kiriu-Kosho-Kuwaisha, First Japanese Manufacturing & Trading Co., Tokio, Exhibit #14, 63, 117, 223, 286, Main Building, Bldg. #1. Trade card for Kirius Kosha Kuwaisha (English and Japanese) with banners and wall hangings surrounded by two dragons. Recto: chromolithograph. Verso: black ink on white card.